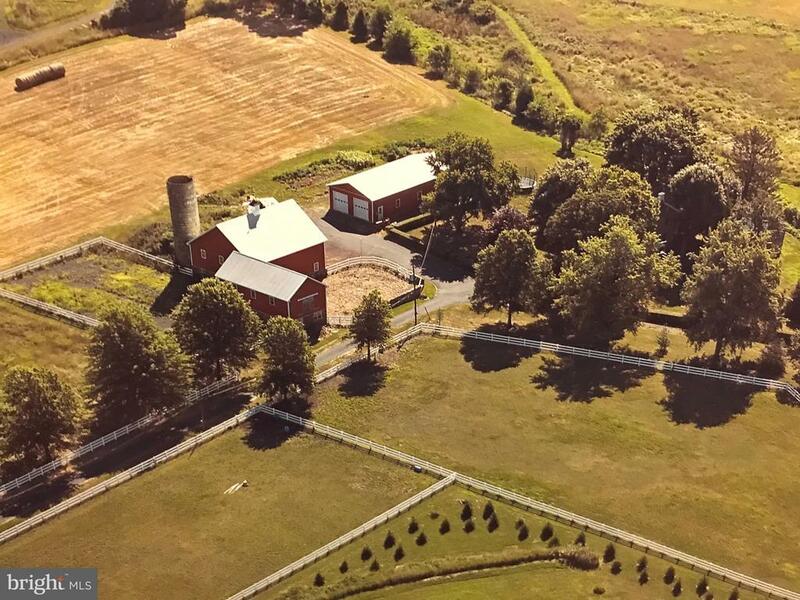 Quintessential bucks county horse farm just minutes from doylestown! 7. 5 pastoral acres with two ponds, exceptional 4000+ square foot home, horse barn, huge multi-purpose barn with 16 ft doors, 6 car detached garage and spring house. Every inch of this property is in excellent condition, tasteful, and immaculate. The original 1857 stone home was a 2 family dwelling. It has been converted to an absolutely gorgeous single family home with great in-law/caretakers suite. So many possibilities exist to easily transform it into a different configuration for your personal needs. Enter the slate foyer which is flanked on both sides with benches to shed your outerwear. Come into the 2014 kitchen addition that sparkles as the sunlight radiates from front to back. The radiant heat in the hardwood floors keeps you cozy while the many windows were designed to capture every view. The custom shaker style inset cabinets have anything you could ask for - accent glass cabinets, farm sink, pull out spice cabinet, hidden garbage, and large pot drawers. The kitchen island is done with a colonial blue accent. Quartz top the counters. The breakfast room sits at the front of the house with great views of the pastures. There is a rear exit here that takes you to a large slate patio with a view of the spring house, two ponds and beyond. The great room is just that. 25~x 14~ of open space for dining and relaxing! It has original pumpkin pine flooring which continues through most of the house. A full bath can be found on this level. The lovely deep windowsills climb the original stone house; every window was replaced when the kitchen was added; all plumbing and electric were also replaced from 2004-2014. To the side of the great room is a family room great for tv, hobbies, etc. Plus a guest room/office and a full bath with a double sinks. Up the main staircase there is a nice size master bedroom with dressing room and direct access to the upstairs bath. There are three additional good sized all with ample closet space. The third floor bonus room is for anything your heart desires 34~ x 16~ of finished open space. The in-law/caretakers space is accessed around the rear of the home where you~ll find a covered porch entry. A full eat-in kitchen,family room and laundry finish out the first level of this suite. Upstairs the in-law master bedroom is highlighted by volume ceilings charmingly finished with knotty pine boards. Off this master is a sitting room, walk in closet, and full bath with glass shower and pedestal foot tub. The basement is great for storage and utilities. It is under the entire home with a crawl space under the kitchen addition. On the exterior, the barns date back to 1800. They did suffer a fire and were rebuilt in 2007. The original stone foundation remained intact. The horse barn currently has 3 stalls with room for another. The entire floor is rubber mat. There is room for 1200 bales of hay. The large barn is 40 ft x 46 ft~ of open space with 16 ft doors. The use for this building is limitless. The garage is 30 ft x 60 ft with three 10 ft x 10 ft doors. There are 2 fenced pastures - one acre each. There is also a riding ring with all weather footings and lights. There is a dry lot. This beautiful piece of property boasts two ponds (stocked) each pond has a deck -one lighted. Sit on the front porch, the back porch, the patios or docks and enjoy the scenery in every direction. Come and enjoy all this property has to offer. 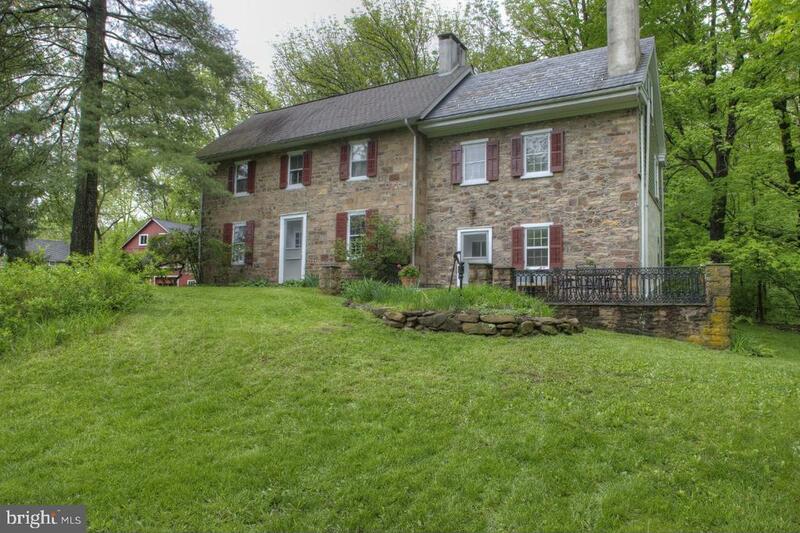 Spring has arrived and so has this bucks county classic antique stone farmhouse. First time this well cared for, 4 bedroom 2 bath estate has been offered in nearly 50 years, looking for its next caring steward. Nestled on a long flag lot with open meadows and beautiful wooded areas providing privacy yet minutes from the cultural experiences of doylestown shops and restaurants. Combined 2 lot parcels total 10+ acres sold together (main house lot is 6. 499 acres and vacant lot is 3. 62 acres). Inside the main house the circa 1700-1800's charm and character abound. 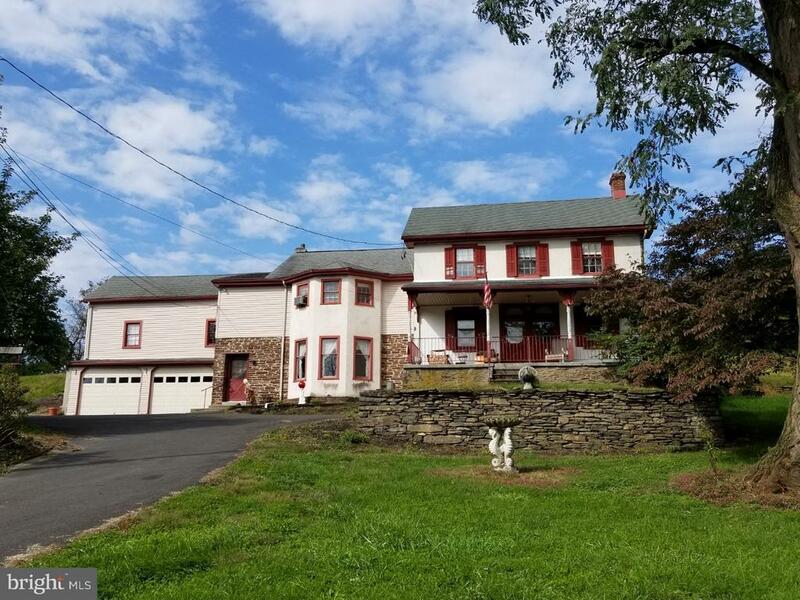 Gorgeous wide planked hardwood floors, large sunlit picture windows, 2 beautiful stone fireplaces, central air, family room addition with cathedral ceilings, formal dining room and charming breakfast room with walk-in hearth. Kitchen is equip with all new stainless steel appliances. Property includes the main house, spring house, sylvan in-ground swimming pool, gazebo, 3 car garage plus large 2 story barn/garage with endless possibilities. Cross a quaint bridged path and discover the goat house and very large barn with 4 horse stalls and tons of additional storage. Award winning bucks count school district. Whether you are looking for a home with old world charm and plenty of open land great for owning livestock or for an ideal development opportunity, this farm on curly hill road in plumstead township has just what you are looking for. The property consists of 22. 09 acres of farmland, a large barn and a 5 bedroom farmhouse with 2 car attached garage that was originally built in the 1860s. With just a little tlc, the property could be turned into the ideal gentleman's farm. Its spacious front porch makes a great space for relaxing in the shade between your outdoor chores and the wide plank hardwood floors, exposed beams, deep window sills and antique fixtures fill the home with a rustic ambiance that is hard to find. There is also real value in the property if you would like to subdivide it. The property taxes are extremely low for the amount of acreage due to it being preserved open space under act 319. Its rural residential zoning would allow the land to be subdivided into a series of 2 acre lots should the act 319 designation be removed. Other permitted uses in addition to general farming and residential dwellings include agricultural retail, riding stables, boarding of horses, home occupation businesses, public recreation facilities and private camps! Open house - april 28th - 1:00-3:00 join us! !welcome to this bucks county classic home situated on over 1. 5 acres in buckingham township. 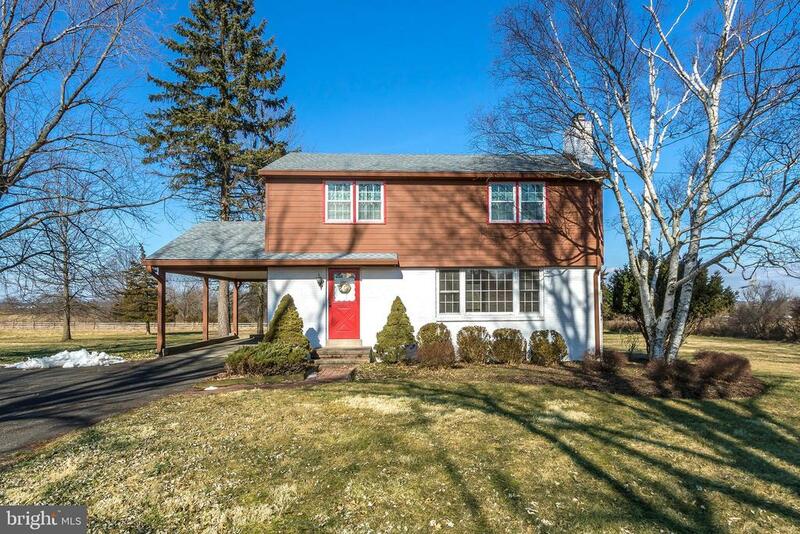 This is home over looks a horse farm in a blue ribbon central bucks school district. This tree lined community offers its residents both space and privacy. This luxury home is one of zaveta's finest, with a long driveway that leads to a side entrance 3 car garage. Septic inspection passed a year ago. The front has a nicely landscaped walkway that leads to a dramatic 2 story front entrance with a winding staircase. The foyer has beautiful hardwood floors that takes you into a brand new totally remodeled gourmet kitchen with white marble tops, a nicely sized white marble center island with room for stools, tile back splash, and stainless steel appliances. Plenty of cabinet space, two pantries, and bar area with a wine refrigerator below. This home has two story sun drenched eat in kitchen that is flows nicely into the family room that has open exposed beams giving you an open and airy feeling. You will also enjoy the attractive floor to ceiling wood brick fireplace on cold winter nights. Directly off of the kitchen is a 3-tier deck with views of nature and privacy. There is also a large side lot with loads of room for outdoor activities. The downstairs features include custom crown molding, wainscoting and random oak floors. First floor includes formal living, dining and a separate private office with wood burning fireplace. Basement offers a large finished area with glass doors leading to the back yard and a large unfinished area ideal for storage and the homes utilities. The upper level offers an impressive master bedroom. The main suite comes with vaulted ceilings, two walk-in closets, a luxurious bath with double vanities, granite counters, custom shower with seamless glass, rain shower head. Additional 3 bedrooms are sizable and are served by a hall bath with double sinks. Don't miss your chance to see this gorgeous home and make it you very own!pride of ownership is apparent with the many upgrades that have been placed into the home. This country colonial provides the ability to enjoy country living at its best. Surrounded by horse farms and country homes. Accessed by a quite country road. Enjoy the peace and tranquility of your surroundings. Four bedrooms, 1 and a half baths. Hardwood floors throughout except in kitchen and baths. Spacious living room 20 x 12 with brick fireplace surrounded by built-in shelves and drawers that provide extra storage or space to display treasures. Dining room has access by sliding doors to deck overlooking a private backyard. Roof, siding and windows replaced in 2017. Property is being sold in ~as is~ condition by seller~s request. House in good condition, but kitchen and powder room need to be upgraded. Some tlc need but well worth the time and effort. Award winning central bucks school district system. Seller will offer credit at closing for septic.